Rivian founder and CEO RJ Scaringe speaks to the crowd Monday, Nov. 26, 2018, at the Griffith Observatory in Los Angeles. Behind him is the R1T pickup truck. The back of the Rivian R1T pickup truck at Monday's event at Griffith Observatory in Los Angeles. Actor Max Greenfield from "The New Girl" checks out the Rivian pickup. The front end of the Rivian R1T pickup truck at Monday's event at Griffith Observatory in Los Angeles. Rivian wowed a crowd of investors and other VIPs on Monday as the EV startup’s pickup made its first public appearance under—and in front of—the stars in Los Angeles. 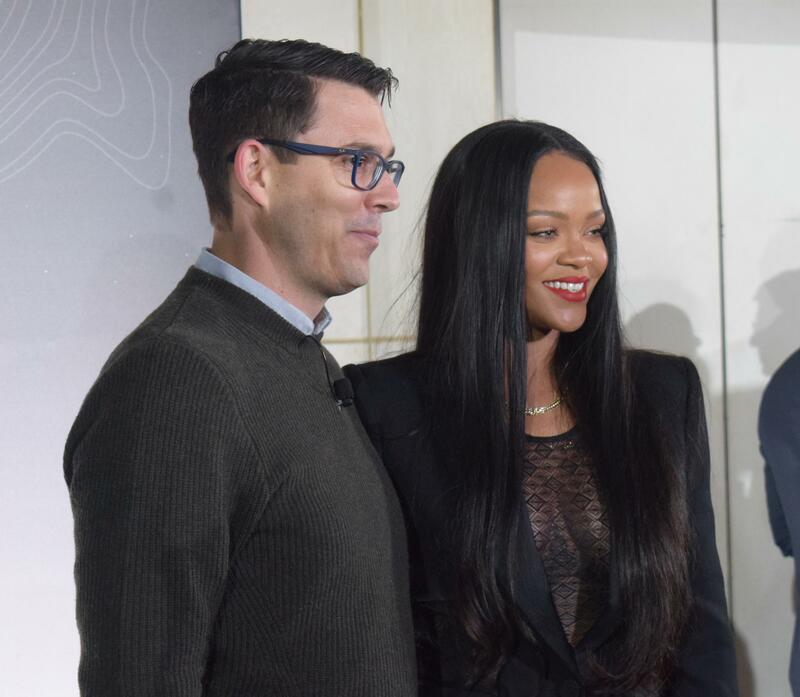 Music star Rihanna appears with Rivian founder and CEO RJ Scaringe on Monday at the Griffith Observatory in Los Angeles. “We’re honored to be able to finally show what we’ve been working on now for years, at a facility (Griffith Observatory) that so much aligns with what we believe in,” said Rivian founder and CEO RJ Scaringe before the R1T pulled in front of the crowd and the LA skyline. Rivian, a 9-year-old company, exits stealth mode this week at the LA Auto Show, where the R1T and a companion SUV (the R1S) will debut. The vehicles launch in 2020 and 2021 and will be built at the Normal manufacturing plant that Rivian acquired for $16 million two years ago. Rivian enters an EV market long dominated by Tesla, hoping to find a niche with so-called “adventure” vehicles and the surging popularity of pickups and SUVs in the U.S. market. Video: Watch Rivian's reveal Monday night in LA. Monday began with a flurry of media reports about the R1T from the LA Times, Wired, Car and Driver, and many other publications. Preorders for the pickup (starting at $69,000) opened Monday morning, requiring a $1,000 deposit. Rivian said traffic was so high to its website that it temporarily caused problems. The good news is, many of you are visiting our site to check out the R1T. The bad news is, due to high traffic, our website is experiencing some issues. We are working to solve them and apologize for the inconvenience. One of the preorders is the Town of Normal, Koos said. It’s unclear how the vehicle will be used—other than it would be highly visible. The Town of Normal, in partnership with Rivian, is also talking to the state of Illinois about making McLean County a test site for autonomous vehicle research, Koos said. Rivian’s launch vehicles will be Level 3 highway autonomous, meaning drivers can take their hands off the road but must remain alert inside. The Illinois Department of Transportation recently launched the Autonomous Illinois testing program, looking to pair up tech and car companies with willing communities. Many of those at Griffith Observatory on Monday were Rivian employees from the design, engineering, and other teams. Also there was John O’Steen, who knew Scaringe when the 35-year-old was just a kid growing up in Florida. O’Steen said he became the first outside investor in Rivian a decade ago—the first one after Scaringe’s own father. Rivian is now funded in part by the Saudi conglomerate Abdul Latif Jameel and other global firms. Rivian’s LA premiere continues Tuesday with a midday press conference when the R1S (SUV) will be introduced. Pricing and technical details for that have not been released. Rivian’s pickup knows how to make an entrance. Its headlights (and really the entire front end) are signature. Instead of horizontally shaped, the oval headlights are vertical—like you’re looking down at two LED-illuminated mini stadiums. They’re connected by a horizontal bar of light stretching side to side. Nearly two years after announcing plans to buy the shuttered Mitsubishi Motors plant, the electric automaker Rivian is ready to reveal its two launch vehicles at the LA Auto Show. Two years ago when Bloomington-Normal first met Rivian, it looked like a one-man band. R.J. Scaringe was seemingly the face, the brains, and the extent of the operation.